You must have heard the research carried out by the security firm, Bluebox Security research which had discovered a loop hole in Android’s security model that could be exploited by hackers to convert genuine apps into a malicious Trojan. This was reported just a week ago and Google immediately swung into action by providing a fix for the flaw. For the uninitiated a few days back, Jeff Forristal, CTO of Bluebox had revealed that the flaw in Android’s security model has been around at least since the release of Android 1.6. He added that the flaw is likely to affect any random Android phone released in the last 4 years. This number may be in millions and the security flaw can be exploited for anything from data theft to making it a mobile botnet. 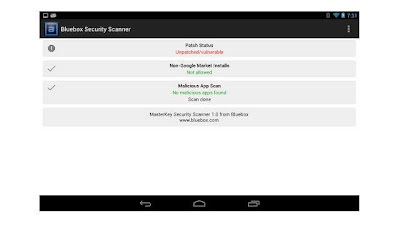 However to check whether there is indeed a malicious code running in your phone the researchers Bluebox have today released a Android App called Bluebox Security Scanner and have made the App available for free download. Once you have installed the App, it will scan the device to see if your system is vulnerable or patched to the vulnerability that was found affecting most Android devices. The app will also check whether the system settings on a user’s Android device allows non-Google Market application installs. It will also look for any installed apps on a user’s device trying to maliciously exploit the flaw. Once the App identified the problematic App you can safely delete the App and save your confidential information. To download the Bluebox Security Scanner visit Google Play now and get your Android device scanned.